I also receied a filled to the brim box from AuntieKar today! I got in late so I may not be able to get pics until Saturday But she sent me some amazing stuff!!! So be on the look out lol! Mandykaye - I have no idea how you got all that into one little box! Everything is awesome, but that spoon wand it just adorable. My fault for forgetting to put the note in the box! I received from pupper last night and I am not sure how everything got stuffed in this box! Then there are some stamps, wooden shapes, little Halloween ornaments that I need to make a tree for, awesome buttons, and some sweets. Finally, the most awesome Halloween cards that I should have taken separate photos of, the best vintage postcards which are all displayed, and lots of Halloween/fall papers and stickers. Kayrun, I pinned your pumpkin swirls. Thought they were too clever not to share with a wider audience. I may have to use some myself! Love the HP bag. Is that a candy corn pull on the zipper? The vintage Halloween cards are so cute. 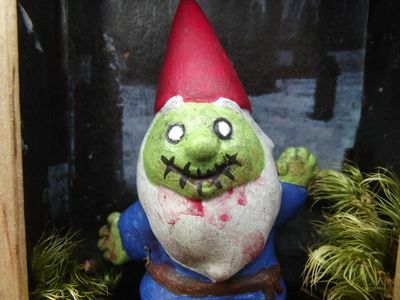 Makes me want to bring the little girl to my house to Trick-or-Treat. Have just spent the last few hours playing with my new camera, my picture software, and my laptop. 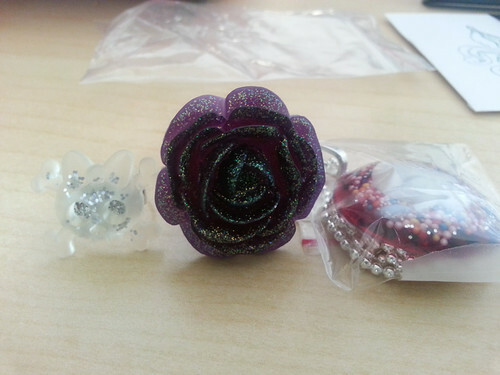 Think I've finally gotten the bugs worked out, so here goes: my awesome swaps fron RaraAvis! First, a group shot of the Jack-o-Lantern/vampire bat bunting that she made for my classroom, 4 tiny but incredibly detailed handcarved stamps, and a felted owl based upon my Pinterest boards. Next, a close-up of the amazing witchy owl that RaraAvis created. Esmeralda is sitting on the shelf behind my laptop keeping an eye on everything I do and making sure our onery cat, Cassa Nova, doesn't try any of his shenanigans on her. (For those of you too young to know, Esmeralda was Samantha's wacky, but often wise, aunt on the old TV series Bewitched. Since Esmeralda was played by actress, Alice Ghostley, a native of my hometown, I thought it befitting to share her character's name with my owl. Don't you just love her expression? And her broom and hand-stitched tulle hat? RaraAvis also included a variety of chocolate candies as well as some black licorice strings, but unfortunately they didn't make it into the photos. Someone spirited those things away before I could photograph them. I need to ask Esmeralda if she saw who-o-o-o the culprit was. I received my package from spookygurrly this morning!! Oh,..Mah,,..GAWD! I can't wait to post pics!!! Hopefully tonight. Stay tuned. She blew my mind. 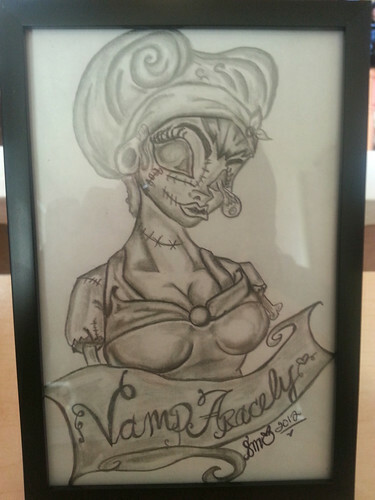 I got my package from ChevelleZombie today and it's awesome! 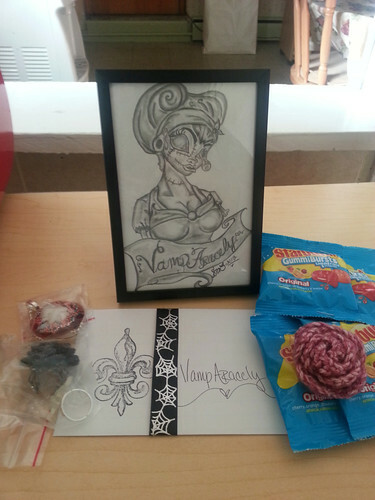 I got starbursts, crochet flower, two rings, a necklace, and a beautiful zombie drawing with my username on it. Closeup of the amazingly beautiful drawing in a frame.